Heroic Adventures » Are You Ready For A Heroic Adventure? The Kohipress Original Portable French Press Coffee Maker is a high-quality portable coffee maker that also doubles as a convenient thermos. It offers true coffee lovers a way to have their cake (I mean coffee) and eat it too! No matter where you go, you can always take your coffee with you with this handy handheld coffee maker. The first time I saw this, I had to take a second look and ask myself, “Does this actually brew coffee?” It resembles the older stainless steel coffee thermoses you can get that simply keep your coffee warm. But believe me, this item does brew your coffee! The process emulates a large scale coffee maker, and the result is just as good as if you got it from a well-known cafe. When a perfectly brewed cup of espresso is the only thing you can think about in the morning, it can be tough to go without it. And while you could get one from the local shop, it’s not always an option. Or worse, you could end up with an espresso you wish you hadn’t tasted. Manual portable espresso machines work, but they rarely produce the right amount of crema. And you don’t always have access to hot water or have the time to pump the water through the grounds manually. 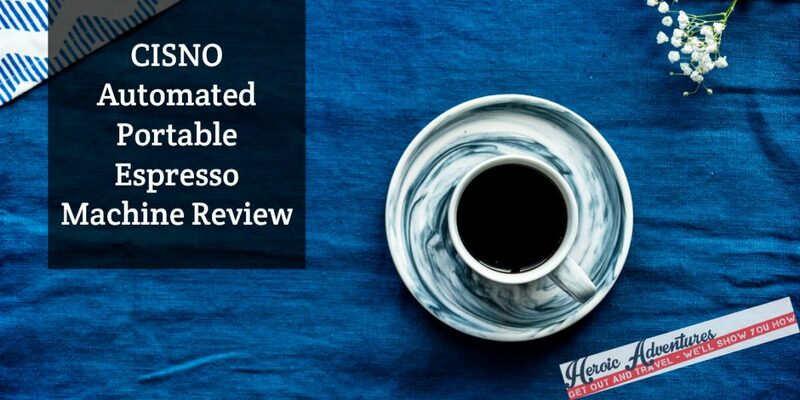 The CISNO Automated Portable Espresso Machine eliminates both those problems, so we thought it was worth a closer look. When that afternoon slump settles in, you probably head right to the kitchen or break room to fetch a cup of coffee. If there’s none made, you probably go ahead and make a pot, but you have to wait a good ten minutes or more for the thing to brew. When there’s already coffee in the pot, well, you don’t really know how long it’s been sitting on the burner, do you? Nobody wants to drink old, burnt coffee, no matter how sleepy they are. Enter the single-cup coffee maker. Scaled down for the coffee drinker who likes it fresh and fast, this handy appliance is practical and portable. Here, we look at the CHULUX Single-Serve Coffee Maker so you can decide if such a contraption is right for you. When you are ready to climb as high as you like with poles that deliver nearly effortless performance due to their lightweight construction and ergonomic grips, MUDDY BEAR Ultra Lightweight Trekking Poles are a good choice. You may be pleasantly surprised to discover that this affordable pair of poles is just what you need for hiking, trekking, or walking. They deliver everything you need to enjoy your next adventure – reliable performance, easy transport, and joint support. This in-depth review has all the information you need to determine whether or not MUDDY BEAR Ultra Lightweight Trekking Poles fit your current hiking needs. It’s hard to enjoy a hike when your muscles and joints are tired and sore, or you have to focus more on not falling than on enjoying your surroundings. Hiking poles make it easier to get around. With the right set and the proper technique, you’ll be able to go further, feel less fatigued, and have less pain or swelling as a result. If you fall, have an injury, or are dealing with mobility issues, your walk might prematurely end if you can go at all. A reliable set of hiking poles will give you added stability and something to rest on when you need it. You’ll even have more confidence when walking.